Angiogenesis, the formation of new blood vessels sprouting from existing ones, occurs in several situations like wound healing, tissue remodeling and near growing tumors. Under hypoxic conditions tumors secrete VEGF which activates endothelial cells (ECs) in nearby vessels, leading to the migration of ECs out of the vessel and the formation of growing sprouts. Several mechanisms are involved in angiogenic EC migration, such as chemotaxis, haptotaxis, haptokinesis and proteolysis of the extracellular matrix (ECM). 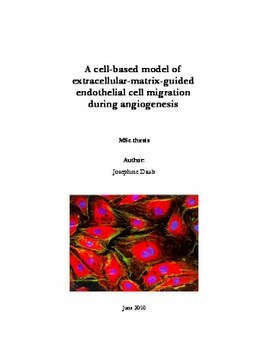 In this thesis we present a cell based model of angiogenesis, based on the Cellular Potts Model (CPM), which includes these mechanisms in simple rules. We show that this simple set of rules is sufficient to form sprouts and even branching vascular networks. Daub, J.T. (2010, June). A cell-based model of extracellular-matrix-guided endothelial cell migration during angiogenesis. CWI.